More than 1,000 Somerset businesses have now registered on a dedicated website as potential suppliers to the multi-billion pound power station project planned at Hinkley Point. 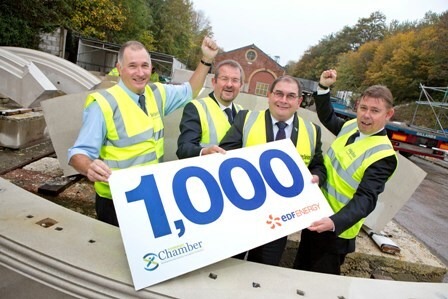 To mark the occasion, EDF Energy and the Somerset Chamber of Commerce called in to congratulate the 1,000th local firm to complete its registration. Sterling Services Ltd, based near Taunton, specialises in architectural precast concrete and is hoping to secure a contract to supply material to the Hinkley Point C project. EDF Energy has already awarded £61 million worth of contracts across the south west, with £25 million of this total going direct to firms in Somerset. Local contracts include a wide range of goods and services, such as plant hire, training, catering, carpenters, building firms, tree-planting and scaffolding. Companies in Bridgwater, Taunton, Burnham-On-Sea, Cannington, Glastonbury, Highbridge, Minehead, Watchet, Yeovil, Weston Super Mare, Bath and Bristol are among the 200 south west firms to have already been awarded contracts. The high number of local registrations is the result of a partnership between EDF Energy and Somerset Chamber of Commerce to capture the capability of local suppliers and to ensure that this capability is promoted to EDF Energy and its main contractors. The hinkleysupplychain.co.uk website has also been use to keep local suppliers informed about the project and work package timetables and Somerset Chamber manage a number of supply chain events to inform and promote effective engagement for local suppliers. EDF Energy has also established a local supply chain team to offer advice and support to Somerset firms. Kevin Lazenby, Director of Sterling Services, said “Sterling Services Ltd registered to be part of the Hinkley Supply chain having learnt about it from a Construction Industry breakfast. We are delighted to be the 1000th company to register and having traded from our premises in Hatch Beauchamp, Somerset for the past 15 years, we feel that we are ideally placed to supply the Hinkley C projects. Jamie Driver, local supply chain manager for EDF Energy, added: "Companies may tend to think that as it's a nuclear power station, the work is all very complex and somehow won't be for them. However, we're looking for companies that can supply all the trades, goods and services that a construction project involves, just on an Olympic scale. Then there are all the things that the workforce will be spending their wages on locally. My message to local companies is to register your interest now, because there is help available to position your business to benefit. But we can't use you if we don't know about you." The proposed Hinkley Point C power station will provide around 25,000 jobs over the construction period, as well as 900 permanent jobs once operational. The project will also create around 400 apprenticeships. £7.1 million has been invested or committed to by the energy company to improve local skills and training at West Somerset Community College and Bridgwater College to increase employment opportunities for local residents. In addition to 1,000 Somerset firms registered, over 550 companies have registered their interest on a national supply chain database. Hinkley Point C is subject to planning consent and a final investment decision by the end of the year. An accredited member of the British Chamber of Commerce, Somerset Chamber of Commerce is proud to represent and work collaboratively with the Somerset business community to encourage strong, sustainable and creative alliances that promote members’ businesses, raise the profile of the county, and help to lobby for greater influence for Somerset at all levels of government. The Somerset Chamber is a membership-based business support organisation which promotes and lobbies for business development in Somerset. As a combined force, with Somerset's Town Chambers, we represent c.2,000 businesses across the diverse economy of Somerset. The Chamber is committed to promoting economic growth in the county and our core agenda for supporting this includes lobbying for high-speed broadband connectivity, supply chain opportunities - such as the Hinkley C Supply Chain project, encouraging inward investment through the Into Somerset programme, improvements to transport infrastructure and active participation in the Heart of the South West Local Enterprise partnership. Our members have access to a range of services including business support and mentoring, networking events, information seminars and impressive cost-savings benefits. For the benefit of the business community, we manage the county's two premier business events: The Somerset in Business conference and the Somerset Business Awards.